Pulled this set out of the archive. Earlier this week Nik (owned by Google) released a new version of their software plugin suite for Aperture (and those other photo editors) for a much reduced price of $150. Considering the suite used to go for $450-$500 this was a pretty big deal. 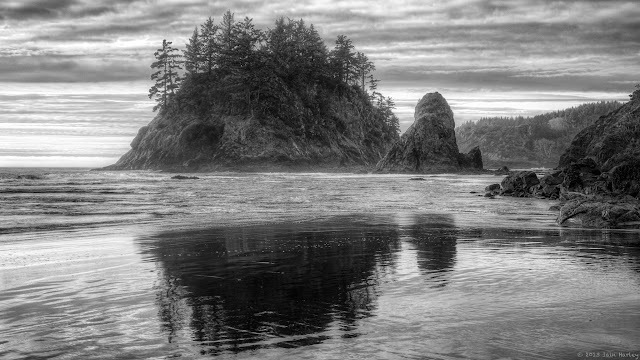 In this suite is an HDR plugin (HDR Efex), a black and white conversion (Silver Efex), a color and tone enhancer (Color Efex), a sharpener, and a denoise tool. 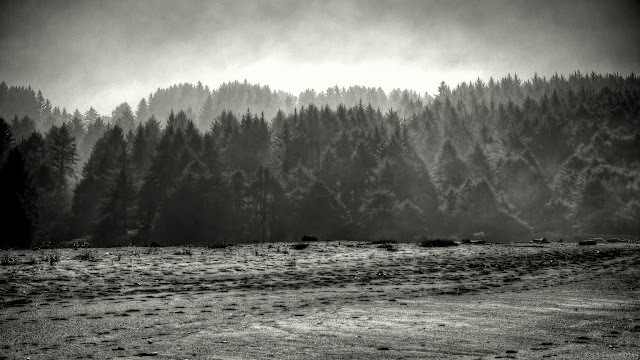 I had gotten Silver Efex and absolutely love it, but had tried some earlier version of HDR Efex that I felt weren't as good as Photomatix, and I couldn't get into using Color Efex. But with this new release and tempting price I thought I'd try them again. Another Monday another week done for my photo projects. For +Weekly Photo Project 2013 the theme was Planes, Trains, and Automobiles. 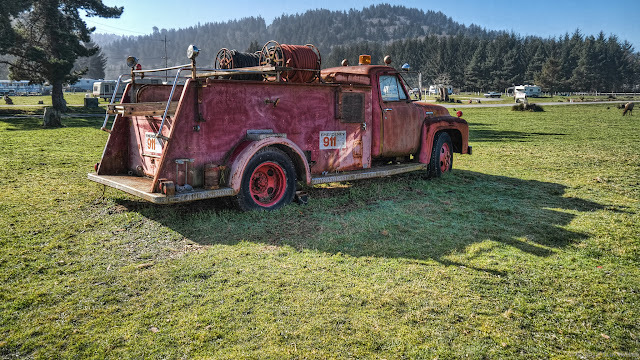 I was tempted to find a copy of the movie and just shoot that, but then this abandoned firetruck ruined those plans. This is a seven exposure HDR that might have gotten a little too sharp and crispy. Especially in the sky, which is why I cropped it the way I did. Week 11 came and went with little fanfare. For +Weekly Photo Project 2013 I used this five shot panorama that I originally thought would be a throw away shot. I was trying to use my auto exposure lock function on my camera (which either didn't work the way I expected, or just didn't work at all for this shot) and thought I'd be tossing this shot after I finished stitching the five shots together. I ended up keeping it because I liked the vibrant colors, and really liked the clouds. If you zoom in (on the original at least) you can even see what I hope to be the last patches of snow on the background mountains. I'm glad I was able to capture the other side of Pewetoll Island at sunset. The light was hitting the island just right, but I was having a hard time capturing it. So I did what I often do and turned the auto-bracket option on and fired of 7 exposures. Then I quickly scampered off the rock that was soon going to be underwater. I couldn't find a single exposure that I really liked so went to HDR them all. It worked out really nicely I think. But I didn't like the large amount of water that was originally showing at the bottom of the photo, and cropping it at 16x9 wasn't doing enough for me. So this is a 2.35x1 crop, or what is sometimes referred to as a cinema crop, since a lot of movies these days are coming out like this. I liked how it worked for this shot. In the background and to the right is Trinidad Head, and to the left you can just make out some of the coastal houses that make up the town of Trinidad. A little late with the blog posting because I was a little late with one of the photos for this week. For +Project 52 B&W I went and grabbed a quick shot of Pewetoll Island (also shown here). The choppier water left me unsure about how the reflection would turn out, but I like that it's not as detailed as past shots I have of it. I love the detail in the island and trees. This G3 is really impressing me, still. Haven't been in a photography mood lately, which is why I completely missed last week and am late with this week's posting. I think I need to dig into my archives and work on some of those. When I get a new camera I like to look through my archive at photos I've really liked from my old cameras and try to recreate the shot with the new camera. This gives me a chance to evaluate the new camera and how it differs from the past ones. This isn't one of those shots that I would use for comparison, mainly because this is two shots merged into one. Using my neutral density filter I took a shot of the falls at f22 giving me a couple seconds of exposure to get the silky look of the falls. Unfortunately it was a bit windy so the foliage around the falls were not very sharp to blurry. So I kept the water part then masked in a shot I took at a much faster shutter speed to pull the foliage in nice and sharp.